Would you like to take an autumn break? Wouldn’t it be nice to surprise him (or her) with a romantic getaway in the mountains and sleep in a castle ? A romantic holiday break in the mountains at this magnificent fortress castle, the first Cistercian settlement in the valley of L’Aquila, built in 1222 by Placido of Roio. 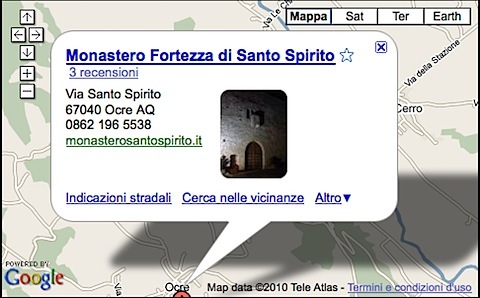 The Monastery was built on a piece of land donated by Count Berardo of Ocre. 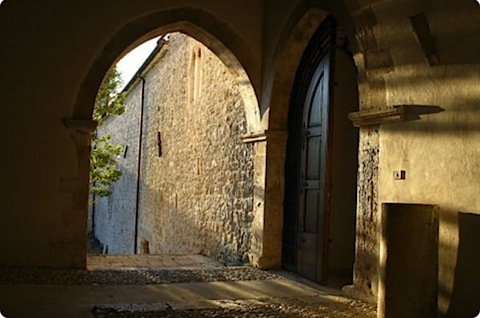 After the founder’s death in 1248, the monastery came under the auspices of the Cistercian Order and the Convent of Santa Maria in Casanova, near Penne. In 1330 it was given in trust to the cardinals Maffeo and Francesco Barberini; in 1652 it was included in the list of the small monasteries abolished by Pope Innocent X. The monastery is rectangular with high boundary walls nearly isolating the complex from the surrounding landscape. 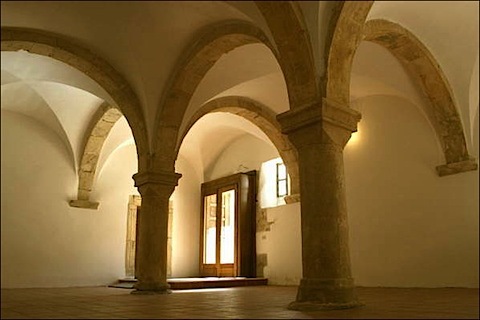 The internal space opens onto a square courtyard, originally a cloister and accommodating on each side, in the Cistercians convention, the church, the refectory, the dormitory and the chapter-room. The main facade has only five openings: a driveway entrance with a pointed Burgundy arch, the pedestrian entrance and three elegant double lancet windows, one of which looks onto the main entrance called “spia piombatoio”. 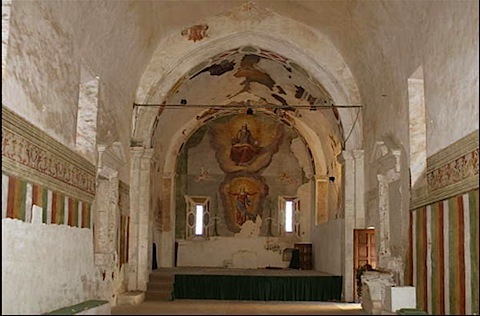 In the church, with a pointed vault left unfinished, there are frescoes dating back to 1280 while in the presbytery, are paintings dating back to the the 16th century, attributed to Paolo Mausonio. Frescoes featuring images from the life of Beato Placido and dating from the 13th century decorate the adjacent sacristy-chapel. 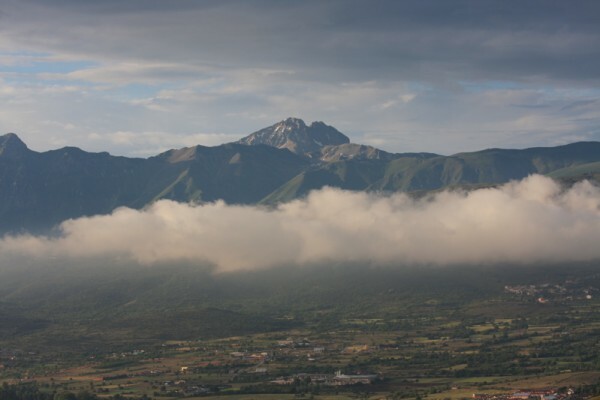 Ocre is easily reachable by car – you can rent a low cost car at any major airport in Italy and drive you way to Ocre through the mountains of Abruzzo. 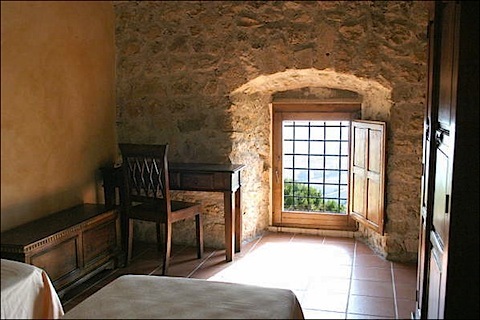 Book your autumn holiday at the Fortress Monastery of Santo Spirito in Ocre near L’Aquila in Abruzzo (Italy) or request further information on this and other holiday package deals.